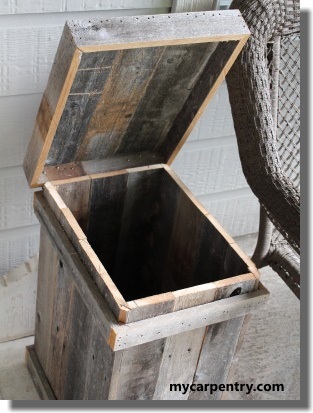 The wood waste basket woodworking project is excellent for your patio, deck or wood shop. 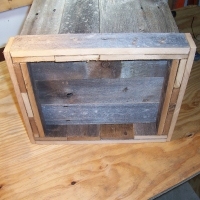 It is made of old weathered cedar fence boards, but you can use new material if you prefer. I recently added a closeable lid to this waste basket. 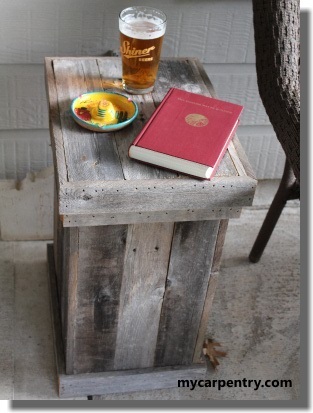 When closed, you can use the container as an end table on your patio. If you have any suggestions or questions about this project, please don't hesitate to contact us! 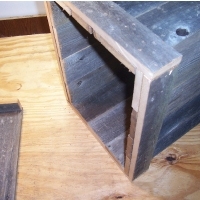 Building the wood waste basket is quite simple. 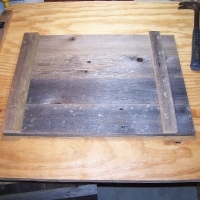 You may have noticed that I like to use old fence boards for many of my projects. The wood is free and the rustic appearance looks good on a patio, deck or workshop. I fastened all of the pieces together using an air stapler and 1.25" staples. You can use other fasteners if you choose, but keep in mind that they must be long enough to hold the parts together, but short enough so that they don't go through the material. The tools I used to build this project were a table saw, miter saw, air stapler, tape measure, pencil, and square. 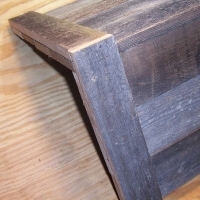 The outside dimensions of the wood waste basket are 17" wide X 13" deep X 23" high. The example project's uprights are all equal widths, but this is not a requirement. As long as the combined widths equal the overall required width of the sides and end pieces, then you are fine. Examine the diagram below for details. Step 1 - As mentioned earlier, you don't need to make the widths of each of the fence board planks equal, but if you decide to, divide the width (15") by a number that will allow you to make the best use of your fence boards. For example, dividing 15" by 5, will give you a width of 3" for each plank (only about 1/2" or so of each board is waste - this is good). Cut these rips into four 21.5" long pieces. This is enough material for the uprights of one side. Repeat the above steps to cut the uprights for the other side. Next, rip another 6' fence board 2.25" wide. When you're done, you will have a 2.25" wide piece and a 1.5" wide piece (roughly). From the 2.25" wide piece, cut a piece 15" long. From the 1.5" wide piece, cut a piece 145 long. 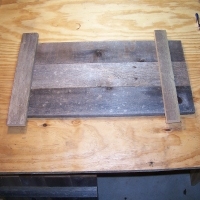 Use these two pieces to assemble the sides as shown in the diagram to the right. Nail the 2.25" piece flush to the bottom of the uprights, and nail the 1.5" piece 1.25" from the top. Step 2 - To determine the widths of the uprights of the end pieces, keep in mind that the ends, when assembled, will actually fit inside the two side pieces. So, subtract the thickness of the side pieces from the overall required outside measurement (11"). Assuming that the fence boards are 3/4" thick (and most of them are), subtracting 1 1/2 inches (the combined thickness) from 11" leaves 9 1/2". Divide 9 1/2" by 3 results in a width of 3 1/8" (roughly). Rip a couple of fence boards 3 1/8" and cut the lengths 21.5". Building the ends is similar to build the sides. 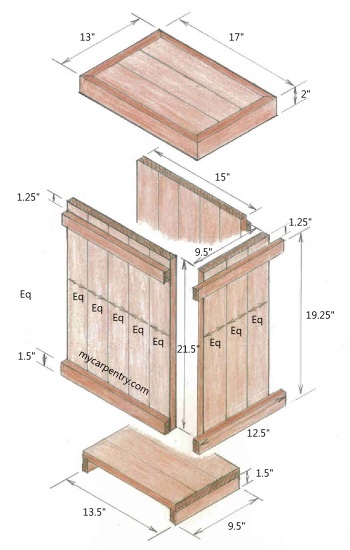 The only difference is that horizontal pieces will stick past the edges of the uprights 1 1/2" on each side (assuming 3/4" thick fence boards and 3/4" thick horizontal trim pieces are used). 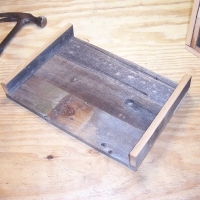 Step 3 - After both sides and both ends have been constructed, attach the assembled ends to the sides as shown in the diagram to the right. Step 4 - This diagram shows the bottom of the wood waste basket after the sides and ends have been attached. Measure the inside of the bottom of the container to determine what size to make the bottom piece. The dimensions should be close to 9 1/2" X 13 1/2". Step 5 - Tip! - Before cutting the material to make the bottom piece, give yourself a little room and make it about 1/8" less in length and width than the actual inside dimensions of the waste basket. Fence board widths and thickness vary quite a bit, and you don't want to have to struggle with the bottom piece when you are trying to install it. Step 6 - Install the assembled bottom piece into the bottom of the container as shown in the diagram to the right. 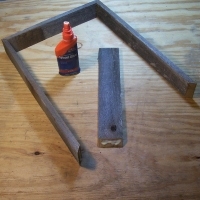 Step 7 - Measure the outside dimensions of the top of the wood waste basket and build a frame as shown in the diagram to the right. The inside dimensions of the frame should be about .25 inches larger in width and length than the actual outside dimensions of the top of the container. This is so the lid will always shut easily. Rip some more fence boards to fill in the top of the inside of the frame (see diagrams). When finished, it should rest on the upper horizontal trim. I had some old brass door hinges in my garage to use for my project, so I didn't have to buy any new ones. I like the look of black metal with aged cedar, so I painted the hinges and the tops of the screws with RUST-OLEUM black enamel spray paint. Place the lid on top of the wood waste basket and center it from side to side. 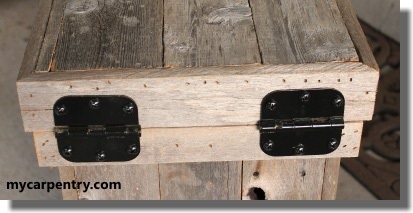 Mark the holes with a pencil or nail and pre-drill them for the size screw your going to use to attach the hinges.